NEW YORK (CNN) -- Amid ominous economic forecasts and repeated bleak reports about America's financial future, messages of hope can be hard to come by. 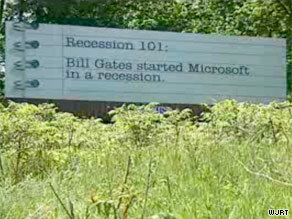 New billboards offer upbeat messages to get people to stay positive during the recession. One advertising campaign, dubbed "Recession 101," has hit the nation's roadsides with an array of slogans aimed at getting people to think optimistically during the recession. The economic "lessons," which include such catchphrases such as "self worth beats net worth," and "stop obsessing about the economy, you're scaring the children," started going up in May and now number around 2,000 postings across the country, according to Jeff Golimowski of the Outdoor Advertising Association of America. Members of the OAAA donated printing, materials and billboard space, while a private anonymous donor paid for the campaign's design, Golimowski said. Recession 101 currently exists in more than 30 states, among them Michigan and Rhode Island, which have been hit particularly hard by the current economic downturn. The clever expressions, presented on backdrops meant to look like lined notepad paper, can be found on digital billboards, traditional billboards and posters. "This will end long before those who started it are paroled," one billboard reads. Most of the mottos do not take a cynical view, though. "Recession 101 isn't selling anything other than the American spirit," the campaign's Web site reads.